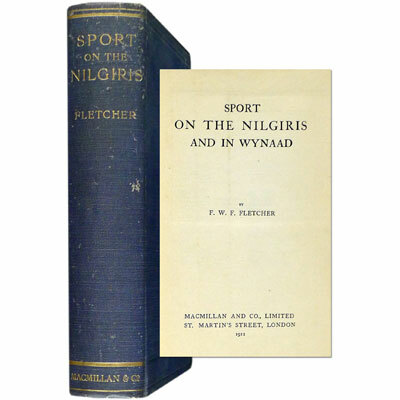 Freshfield’s incredible account of his dangerous and exhausting circuit of Kangchenjunga, considered one of the greatest early works on Himalayan exploration, and a standard reference to the Kangchenjunga massif. The party’s entire route followed previously unknown areas, much of it at a great height: they climbed the Zemu glacier reaching 5,350 metres, then crossed the Lhonak valley and proceeded west over Jongsong La into Nepal, descending along Kangchenjunga glacier, before trekking ahead to Tseram and finally crossing back to Sikkim. Profusely illustrated with two large folding colour maps of Sikkim and the glaciers of Kangchenjunga, forty full page black and white plates, two in-text illustrations of the peaks of Kathmandu and a geological map of Sikkim, and one folding panoramic black and white photographic plate of Kangchenjunga Glacier, taken by Sella. 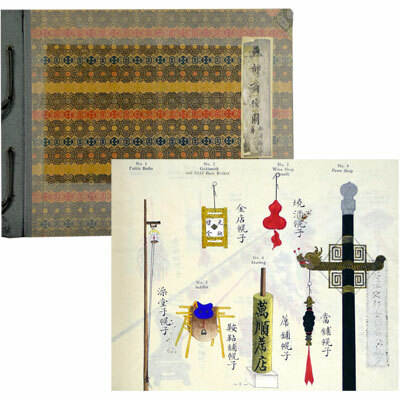 A beautifully hand coloured book showing the signs used by Chinese shopkeepers to advertise their trade, with 101 hand-coloured illustrations of shop signs each accompanied by the Chinese and English description, together with a forward in English by H. K. Fung. A superior copy of the enlarged edition with fifty tipped-on black and white photographic plates by Vandyck, preceded by an introduction by Owen Mortimer Green, who was British editor of the North China Daily News. A finely bound set of Guines’ well respected and profusely illustrated journal, with text in French, covering his time in China and the Philippines. Three octavo volumes and small folio atlas with 92 engraved plates and 6 engraved maps. He later produced his Chinese-Latin-French dictionary, still considered an important work of scholarship. Guignes’ journal also touches on the Mauritius (I’lle de France), at the time the centre of French influence in the Indian Ocean and the principle base of peaceful and military French enterprise [Ryckebusch, n° 3783]. According to Numa Broc "Guignes, who only published his report in 1808, was able to know and use the works of Staunton and Barrow": he thus completed on several points these two relations of the embassy of Lord Macartney in China (Broc, La Géographie des philosophes).